Great taste is just a click away! Order below or scroll to continue to the site. Sam Lord, the most notorious pirate from the isle of Barbados, hung lanterns from the trees near his castle to lure unsuspecting ships to his shores. There he plundered their many treasures, including the finest rum from the oldest distilleries in the Caribbean. Today, that same rum infuses authentic Barbadian flavors into each bottle of Pirate’s Lantern Pepper sauce. The result? Pure Pirate's Gold. 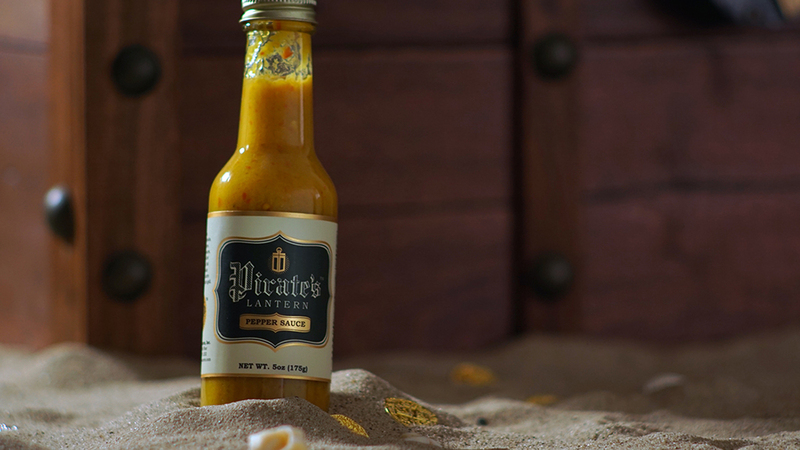 Each bottle contains a savory blend of Caribbean hot peppers (Scotch Bonnet peppers), mustard, vinegar, onions, salt, horseradish, and rum— a pirate’s gold. These simple and fresh ingredients are carefully controlled, starting with ideal proportions, added at just the right time, in just the right sequence. As the sauce slowly simmers, it thickens and evolves into the desired balance of heat, aroma, texture, and taste. When ready, the pepper sauce is promptly bottled, sealed, and sits for a period of time, letting the flavors develop further before it begins the journey to your dinner table. Want to see what pairs well with Pirate's Lantern Pepper Sauce? Yummy!!! I love the sauce. I am definitely getting more. I bought this hot sauce a couple weeks ago and have already used half the bottle. It’s delicious on everything! My favorite new go-to sauce.